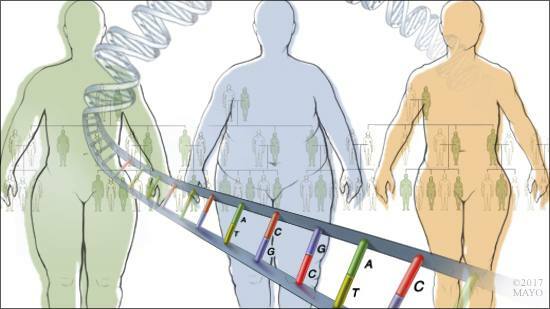 DEAR MAYO CLINIC: How big of a role does genetics play in weight? If you are predisposed to obesity because of your genes, how effective can a diet or other weight-loss strategies really be in the long run? ANSWER: Genetics play a role in determining your weight. But that’s not the whole story. Environment, lifestyle and healthy choices still contribute a great deal to how much you weigh. And your genes also make a difference in the type of weight-loss strategies that may work best for you. When deciding how to move forward with achieving weight loss, all of these factors must be considered. Obesity is a significant concern in the U.S. According to the Centers for Disease Control and Prevention, or CDC, two-thirds of Americans are overweight, and one-third of people in this country are obese. That’s a problem, because obesity is associated with many serious health concerns, including diabetes, heart disease and stroke. The CDC also estimates that the annual medical cost of obesity in the U.S. is about $150 billion per year. With two-thirds of the U.S. population overweight, it’s clear that a better way to manage weight is needed. Rather than approaching weight loss as if everyone has the same problem, a more individualized strategy is needed. Genetic analysis can be useful for creating an individual approach to weight loss. For example, your genetics can make a difference in factors such as how full you feel as you eat, your appetite levels, and how your body uses energy and burns calories. All of those — energy expenditure, level of fullness, appetite, body composition and gastric emptying — can be measured and evaluated. Specific types of testing also can reveal how your body responds to certain medications. That information can be very valuable in crafting a weight-loss program that fits your body’s needs and make it more likely that you will be able to lose weight and keep it off over the long term. An example of how this type of careful evaluation can make a difference can be seen in the use of weight-loss medication. Currently, the U.S. Food and Drug Administration has approved five medications for weight loss in people who are obese. Usually, when these medications are used, about 30 percent of people will not respond, seeing little or no effect on weight loss due to the medication. About 30 percent will respond in a modest way. And about 30 percent will have a significant weight-loss response — equaling a loss of more than 10 percent of total body weight in a year. Recent studies show that, depending in part on an individual’s makeup, health care providers may someday be able to use specific testing and genetic analysis to select the right medication for the right patient. In the future, genetics also may help to show how effective weight-loss procedures, such as gastric bypass surgery or placement of an intragastric balloon, might be for an individual.